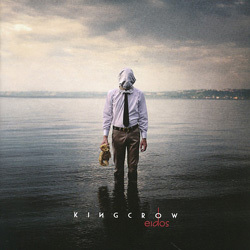 Kingcrow’s latest ‘Eidos’ is apparently a priority release for Sensory, and you only need to get half-way through opener ‘The Moth’ to hear why. Crackling with vitality, it’s a track which showcases everything great about progressive metal, yet still wraps everything up in one four-minute blast. Not a bad way to set out your stall, eh? ‘Eidos’ is the Italian outfit’s sixth album since they opened their account in 2001 with ‘Something Unknown’. Over the years they’ve immersed themselves deeper and deeper into the realms of progressive metal, slowly evolving from newbies to genre leaders, and if their name’s still isn’t all that well known to all and sundry that’s to our shame, not the band’s. ‘Eidos’ seems them expanding their horizons yet further, creating a diverse yet homogenous collection of material which forms a 62-minute musical rollercoaster. For those that care about such things, conceptually the album deals with choices, consequences, regret and disillusion, and apparently completes a which trilogy started with 2010’s ‘Phlegethon’ and continued through their last album, 2013’s ‘In Crescendo’. For those who prefer to let the music do the talking ‘Eidos’ is a masterclass in how to craft the perfect album, and in a field where technical proficiency is a must vocalist Diego Marchesi, guitarists Diego Cafolla and Ivan Nastasi, keyboard player Cristian Della Polla, bassist Francesco D’Errico and drummer Thundra Cafolla now stand head and shoulders above those that used to be their peers. The musicality is, as you’d expect, flawless, and Marchesi in particular is a singer of no mean talent, his voice effortlessly swooping from lows to highs with all the grace of a bird in flight. It’s an album which refuses to give away its secrets too quickly, adding layers of expectation to the complexities of the songs themselves. Songs twist and turn nobly and majestically, kaleidoscopically blending changes in time and style, and although the emphasis is on the metallic side of things the musicians are happy to throw everything into the mix, including a funk workout midway through the boy racer that’s ‘Slow Down’, and a Mariachi-style break in ‘The Moth’. Staccato guitars and drums hammer out rhythms when you least expect them, while aggressive riffing gives way to the most fragile moments of sublimity. There are pleasures aplenty to be found on ‘Eidos’, but ‘On The Barren Ground’, a track whose chorus brings mind evokes the splendour of latter-day Crimson Glory, takes some beating, and the quietly-menacing title track is a musical feast in itself. Proud and self-assured, ‘Eidos’ is certain to be a fixture in many end-of-year Top Tens come December, that’s for sure.